RBI Assistant Posts 2017 recruitment Preliminary Exam Results to be out @ Rbi.Org.In: RBI Call Letter 2017, RBI Assistant Online Prelims Exam Call Letter, RBI Assistant Posts 2017 recruitment Preliminary Exam Call letter download. Reserve Bank of India (RBI) has recently released call letter for attending Online Prelims examination for the post of Assistant. Online Prelims will be held on 27 & 28-11-2017, Online Main Test will be held on 20-12-2017. Candidates who have applied for these posts can download their call letter at below link. Reserve Bank of India has released the admit card for the Online Preliminary Examination for the post of Assistant 2017. The admit cards are available for download on the official website along with information handout. The preliminary test will be held on November 27 and November 28. To download the call letter for the preliminary exam, candidates would need to login to their candidate's profile using their registration number and password created at the time of registration for the exam. Reserve Bank of India (RBI) has released the call letters for the main examination for the recruitment of Assistants. RBI had released the result for the preliminary exam recently and all such candidates who qualified the exam can download their call letters from the official website. The main examination will be conducted on December 20, 2017. Apart from the call letters, RBI has also released information brochure for the main examination. The exam will be conducted in the online mode. How to download RBI Assistant Main Exam call Letter? Step two: Click on 'Opportunities@Rbi' in the footer menu. Step three: In the new window, click on current vacancies tab and then click on call letters. Step four: Click on call letter link for RBI Assistant main exam. Step five: Login using your credentials and download your call letter. After downloading the call letter check if all the information mentioned is correct. Paste a current colored photograph on the space provided on the admit card. You would need to carry a photo identity card along with a photocopy of the same with the call letter to the exam centre on the day of the exam. The exam will be of 135 minutes duration and will consist 200 questions each carrying one mark. There will be 5 sections in the test paper - Reasoning, English Language, General Awareness, Computer Knowledge, and Numerical Ability. Each section will have 40 questions. Candidate will be penalized 1/4th of the mark assigned to a question in case of a wrong answer. There Is no negative marking for unanswered questions. The Reserve Bank of India (RBI)'s recruitment section released the RBI assistant prelims exam results on the official website of the central bank on December 5. RBI assistant prelims 2017 results have been made available on the 'opportunities' link on the official website, rbi.org.in. RBI, in October this year had invited applications for the recruitment of 623 posts of "Assistant" in various offices of the Bank. The RBI assistant selection is being done through a country-wide competitive examination in two phases i.e. Preliminary (Prelims) and Main examination followed by a Language Proficiency Test (LPT). Next stage in the RBI assistant recruitment examinations is RBI assistant main exam which will be held on December 20 this year. RBI Assistant Main examination: The RBI assistant main online examination will be conducted on December 20, 2017, only for the candidates who have been shortlisted on the basis of results of preliminary examination (given here under). Separate admission letters or admit cards for RBI Assistant main examination should be downloaded from RBI Website. The time of RBI assistant main examination and venue of examinations will be indicated in the admission letters. The link for downloading admit cards, information handout for main examination, instruction to PWD candidates/ joint undertaking / declaration form for PWD candidates using scribe, will shortly be made available in RBI website, said a notification posted on the official website of RBI. RBI assistant main examination: RBI assistant main examination will consist of 200 questions for 200 marks in five tests. The tests will be of Reasoning (30 minutes), English Language (30 minutes) , Numerical Ability (30 minutes), General Awareness (25 minutes) and Computer Knowledge (20 minutes). 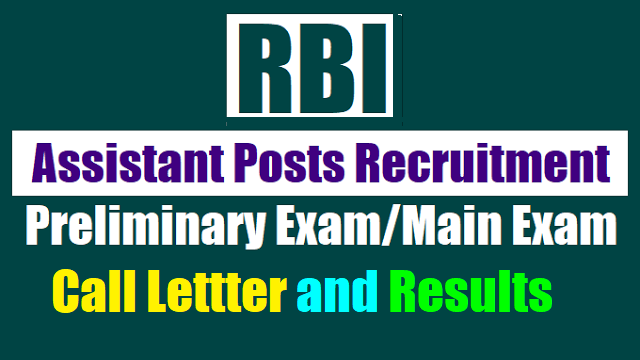 The duration of RBI assistant main examination is 2.15 hour and the candidates may be required to be at the venue for about 2 to 3 hours including the time required for completion of various formalities such as verification and collection of various requisite documents, logging in, giving of instructions. The RBI assistant main examination will be conducted online in venues across many centres in India. The centers for the main examination will be limited than the preliminary exam. If the examination is held in more than one session, the scores across various sessions will be equated to adjust for slight differences in difficulty level of different test batteries used across sessions. More than one session are required if the nodes capacity is less or some technical disruption takes place at any centre or for any candidate. The roll numbers of candidates successful in main online examination will be available on RBI's website in January 2018/ February 2018. According the official notification, only such number of candidates will be called for Language Proficiency Test who stand sufficiently high in merit on the aggregate marks of the Objective Tests, such merit being decided by the Bank in relation to the number of notified vacancies to be filled in. Final selection will be on the basis of candidate's performance in the online main examination, biometric verification and Language Proficiency Test taken together in order of merit. Appointment of selected candidate will be subject his/her being declared medically fit as per the rules of the Bank. RBI assistant online prelims exams were held on November 27 and 28, 2017. The bank is expected to conduct the online main test on December 20, 2017. The Reserve Bank of India (RBI)'s recruitment section has released the RBI assistant prelims exam results on the official website of the central bank. RBI in October this year had invited applications for 623 posts of "Assistant" in various offices of the Bank. The RBI assistant selection is being done through a country-wide competitive examination in two phases i.e. Preliminary (Prelims) and Main examination followed by a Language Proficiency Test (LPT). Since the bank has scheduled the RBI assistant main exam this month, the results can be expected any time soon. The RBI assistant applications were accepted online through the Bank's website www.rbi.org.in till November 10, 2017 and admit cards for the prelims exam were released on the third week of November. The RBI assistant selection is being done through a country-wide competitive examination in two phases i.e. Preliminary (Prelims) and Main examination followed by a Language Proficiency Test (LPT). RBI assistant main exam will be held on December 20. The RBI assistant prelims results link has been attached in this post. The candidates who are searching for RBI assistant prelims 2017 results may scroll down to check the results. Disclaimer: Though utmost care has been taken while preparing the Result, the Bank reserves the right to rectify inadvertent errors, if any. 90 minutes including the time required for logging in, collection of the call letters, going through the instructions etc. All tests except test of English Language will be provided in English and Hindi. You can attempt any question at any time within these 60 minutes as per your convenience. All the questions will have multiple choices. Out of the five answers to a question only one will be the correct answer. You have to select the most appropriate answer and ‘mouse click’ that alternative which you feel is appropriate/ correct. The alternative/ option that you have clicked on will be treated as your answer to that question. There will be penalty for wrong answers marked by you. For every wrong answer marked by you, 1/4th of the marks assigned to that question will be deducted as penalty. (1) Please note date, time and venue address of the examination given in the call letter. (2) You may visit the venue one day before the Online Examination to confirm the location so that you are able to report on time (as printed on the call letter) on the day of the examination. Late comers will not be allowed. (3) The call letter should be brought with you to the examination venue along with your recent passport size photograph duly pasted on it. (Preferably the same photograph as was as uploaded). (4) You must scrupulously follow the instructions of the Test Administrator and RBI Representative at the examination venue. If you violate the instructions you will be disqualified and will be asked to leave the examination venue. (5) No use of calculators (separate or with watch), books, note books or written notes, cell phones (with or without camera facility), or any other electronic device will be allowed during the examination. (6) Please bring this call letter with your photograph affixed thereon, currently valid Photo identity proof in original and a photocopy of the same ID proof which you bring in original - THIS IS ESSENTIAL. Please hand over this call-letter alongwith photocopy of photo identity proof duly stapled together to the invigilator. Currently valid photo identity proof may be PAN Card/Passport/ Permanent Driving Licence/Voter’s Card/Bank Passbook with photograph/Photo Identity proof issued by a Gazetted Officer on official letterhead /Photo Identity proof issued by a People’s Representative on official letterhead/Valid recent Identity Card issued by a recognised College/University/Aadhar Card/E-Aadhar Card with a photograph/Employee ID/Bar Council Identity card with photograph. Please Note - Ration Card and Learner’s Driving License will NOT be accepted as valid ID proof. Please note that your name as appearing on the call letter (provided by you during the process of registration) should exactly match the name as appearing on the photo identity proof. Female candidates who have changed first/last/middle name post marriage must take special note of this. If there is any mismatch between the name indicated in the Call Letter and Photo Identity Proof you will not be allowed to appear for the exam. In case of candidates who have changed their name will be allowed only if they produce Gazette notification/their marriage certificate/affidavit. (7) Your responses (answers) will be analysed with other candidates to detect patterns of similarity of right and wrong answers. If in the analytical procedure adopted in this regard, it is inferred/concluded that the responses have been shared and scores obtained are not genuine/valid, your candidature may be cancelled. Any candidate who is found copying or receiving or giving assistance or engaging in any behaviour unbecoming of a candidate will not be considered for assessment. The RBI may take further action against such candidates as deemed fit by it. (8) You should bring with you a ball-point pen. A sheet of paper will be provided which can be used for rough work or taking down the question number you would like to review at the end of the test before submitting your answers. After the test is over you MUST hand over this sheet of paper to the Test Administrator before leaving the venue. (9) The possibility of occurrence of some problem in the administration of the examination cannot be ruled out completely which may impact test delivery and/or result from being generated. In that event, every effort will be made to rectify such problem, which may include movement of candidates, delay in test. Conduct of a re-exam is at the absolute discretion of test conducting body. Candidates will not have any claim for a re-test. Candidates not willing to move or not willing to participate in the delayed process of test delivery shall be summarily rejected from the process. (10) The scores across various sessions will be equated to adjust for slight differences in difficulty level of different test batteries used across sessions. More than one session are required if the nodes capacity is less or some technical disruption takes place at any centre or for any candidate. (11) Please note that a candidate is allowed to appear only once in the online examination. Multiple appearance in online examination will result in cancellation of candidature. In case more than one call letter has been generated, candidates are advised to appear only once on the date and at the time mentioned on the respective call letter. All other call letters are to be surrendered. (12) Anyone found to be disclosing, publishing, reproducing, transmitting, storing or facilitating transmission and storage of test contents in any form or any information therein in whole or part thereof or by any means verbal or written, electronic or mechanical or taking away the papers supplied in the examination hall or found to be in unauthorised possession of test content is likely to be prosecuted. (13) Instances for providing incorrect information and/or process violation by a candidate detected at any stage of the selection, process will lead to disqualification of the candidate from the selection process and he/she will not be allowed to appear in any RBI recruitment process in the future. If such instances go undetected during the current selection process but are detected subsequently, such disqualification will take place with retrospective affect. Follow the link from organisation website to download call letter. At login page, enter the Registration No / Roll No and Password / DOB(dd-mm-yy) at the required places to download the Call Letter. Step 2: From the 'Current Vacancies' tab, click on call letters. Step 3: Click on the call letter link for Assistant 2017. Step 4: Download Information Handout in your preferred language. Step 5: Click on the call letter download link and in the new window enter your registration number, password/date of birth, and the captcha code given. Step 6: Submit and download your call letter. After downloading take a printout of your call letter and check all the information mentioned on the call letter. Number of questions answered correctly by a candidate in each objective test is considered for arriving at the Corrected Score after applying penalty for wrong answers. The Corrected Scores so obtained by a candidate are made equivalent to take care of the minor difference in difficulty level, if any, in each of the objective tests held in different sessions to arrive at the Equated Scores.